Anyone of a certain age remembers Toonces, the mischievous car-driving cat from Saturday Night Live. But a dog behind the wheel? 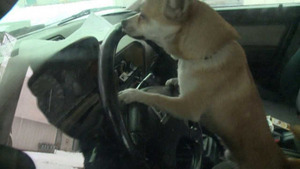 Jason Martinez ran into a Spokane store and left Toby, his Chihuahua, in his parked car for a few minutes. Now that seems just plain ridiculous — right? That’s exactly what Spokane, Wash., resident Tabitha Ormaechea probably thought. That is, until she saw who sat behind the wheel of the car that tapped hers in traffic earlier this month. Ormaechea was heading home after a long, hard day at work when she hit a red light. “I was driving straight, headed west, in hopes of just going home,” Ormaechea tells KREM. All of a sudden, she felt a bump; a car had tapped hers from behind. Nothing too serious, but enough of an impact to cause a jolt. Startled, Ormaechea got out of her car and walked over to the vehicle that had hit her. Expecting to examine the damage, exchange insurance information with the driver, and be on her way, Ormaechea definitely did not anticipate what she’d find behind the wheel: a little Chihuahua. “When I looked up, there was no one in the car, just a little dog up on the steering wheel peeking over looking at me,” Ormaechea remembers. Meanwhile, moments before the fender bender, Jason Martinez left his Chihuahua, Toby, in his parked car for a few short minutes to run into a Spokane store. But when a person ran in from out front, shouting about a dog who’d taken a car for a joyride, Martinez could hardly believe his ears. Sure enough, little Toby had caused the collision. Martinez believes his dog knocked the car into gear, causing the vehicle to roll down the street and into traffic. Luckily, no one was hurt in the incident and both cars only sustained minimal damage. As for Toby? Well, he won’t be getting his driver’s license back anytime soon, that’s for sure.